The mission of the Office of Medicaid Inspector General (OMIG) is to prevent, detect, and investigate fraud, waste, and abuse within the medical assistance program. This mission is achieved through auditing Medicaid providers and medical assistance program functions; recovering improperly expended funds; and referring appropriate cases for criminal prosecution. OMIG works closely with providers and the medical assistance program to prevent fraud, waste, and abuse. On April 23, 2013, Arkansas Act 1499 was signed into law creating the Arkansas Medicaid Inspector General’s Office (OMIG). Act 1499 included a starting date for the new state agency of July 1, 2013. The legislative purpose of the law was to: create a new state agency in order to consolidate staff and other Medicaid fraud detection prevention and recovery functions into a single office; create a more efficient and accountable structure; reorganize and streamline the state’s process for detecting and combating Medicaid fraud and abuse; and to maximize the recovery of improper Medicaid payments. Ark. Code Ann. §20-77-2501. On June 19, 2013, former Governor Mike Beebe appointed Jay Shue to be Arkansas’ first Medicaid Inspector General. With the creation of the Medicaid Inspector General’s Office, the Program Integrity Unit of the Arkansas Department of Human Services and its staff was transferred under the supervision and direction of the Arkansas Medicaid Inspector General. The Program Integrity Unit was formerly a function of the Arkansas Department of Human Services as required by the Center for Medicaid Services (CMS) under 42 CFR §455 et al. All states that participate in the federal Medicaid program and receive funding are required to have a program integrity division that conducts Medicaid fraud investigations and audits and the Medicaid Inspector General’s office fulfills that federal requirement. 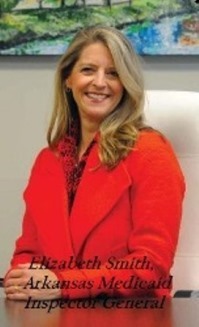 On June 11, 2015, Governor Asa Hutchinson appointed Elizabeth Smith, current Medicaid Inspector General. Smith has more than two decades of experience practicing law, including more than 15 years combined as a prosecutor and later as associate general counsel for the University of Arkansas for Medical Sciences. She also served as deputy prosecuting attorney under Larry Jegley for the 6th Judicial District. She also served as an assistant attorney general of Arkansas under Governor Mike Beebe and with the firm of Mitchell, Williams, Selig, Gates, and Woodyard, specializing in healthcare.